Twelve Fairfax County Park Authority sites are featured in the Discovery Trail Map program sponsored by the Park Foundation. Adults and children who visit eight or more park sites on the Discovery Trail Map during the summer receive a prize pack featuring tickets to mini golf, camping, RECenter admission, and boat, train and carousel rides. Plus they are entered in a grand prize drawing for one of four bicycles donated by Spokes, etc. and Trek! More than 1300 participants, ranging from infants to octogenarians, completed the Park Foundation sponsored 2018 Discovery Trial Map program. All who visited at least eight featured park sites received a prize packet valued at $93, which included tickets to amusements such as camping, mini golf and boat, train and carousel rides. The four lucky grand prize winners are: Mati Lamb, 2, of Burke; Hyorin Choi, 9, of Vienna; Paula Reyes, 17, of Falls Church and the adult winner, Sharlene Ash of Alexandria. Each won a new bicycle and safety helmet provided by Spokes, Etc. and Trek. Spokes, etc. know that kids grow fast and will soon outgrow their bicycles. Their Kids’ Bike Trade-Up Program, allows young cyclists to learn to ride on a quality, lightweight, safe bike without breaking the bank. 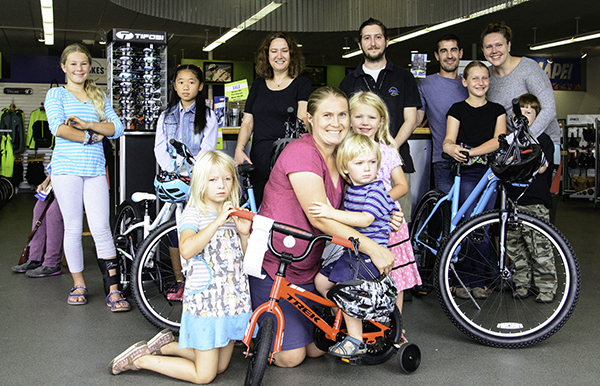 As children grow, Spokes will give purchasers up to 50% of the original price towards the next size bike purchase. When you visit, remember to say how much you appreciate Spokes, etc. generous support of the FCPA Discovery Trail Map program!